As I was cleaning the kitchen this morning for the holiday weekend, I shot a few images to share with you while thinking about how much I love this room. 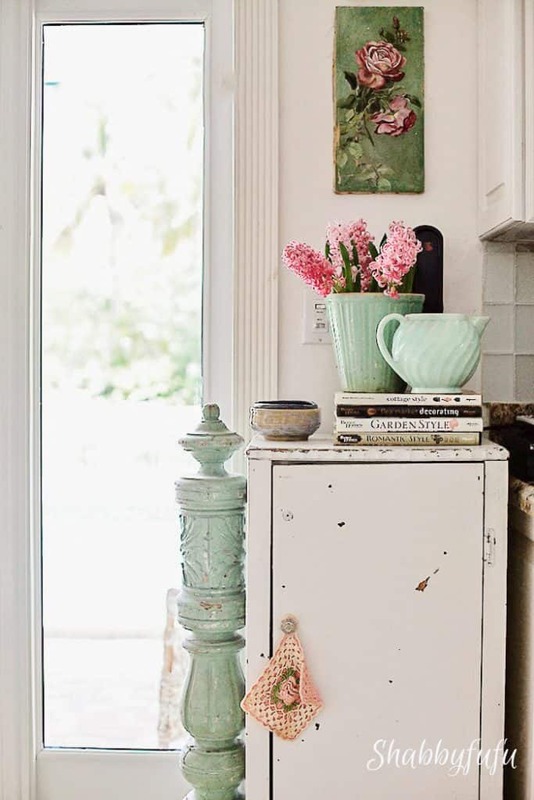 It is this kitchen that attracted the home scout from Better Homes and Gardens, and you probably have seen. the shoot in Cottage Style Magazine, Best Of Flea Market Style and a couple of their other titles. Photo courtesy of Meredith Publications. All of these photos are old, so I’m sorry for the poor quality. This home was built in the 1960’s and is a “ranch style” Florida home. The cabinets in our kitchen are the original and are all wood inside and out. We did this kitchen and the entire house working on a budget and over time. We truly did NOT spend a lot and it is possible to get high style if you are patient! The cabinets have always been white, but we did resurface with new doors when we purchased this home 24 years ago, as we wanted a door with a recess and the old ones were flat. We added the island at some point after pushing out the kitchen into the living room and added the family room that you see in the background. My husband wanted granite counters and I wanted white Carerra marble and a farm sink, but he is the practical guy who won out in this case. As most of you, we work with a budget. We were able to get all of the appliances for free, as someone offered them to us in their own remodeling updates. Score indeed and mostly everything in our home has been been either free or NOT expensive! New knobs and pulls went a long way to update the look here and the cabinets with the glass doors and underneath were adding to coordinate later on. 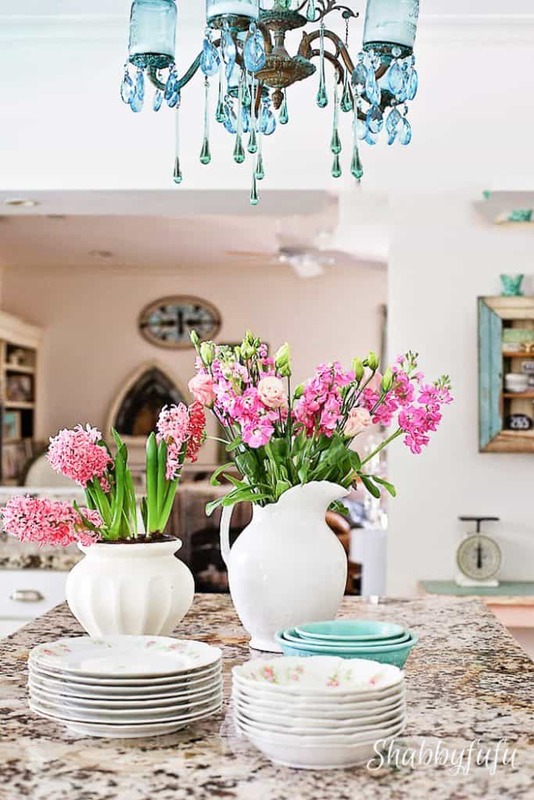 The backsplash is the palest sea green glass tiles, each one laid by hand. I store china and glassware in the upper glass door cabinets and in the lower cabinets are pull out pantry shelves. Nifty old garage sale wood cabinet that I’ve had for years holds linens and some china. It’s chippy with the original paint (painted aqua inside:-), just how I like it. The old porch column is another “keeper” piece from years gone by. 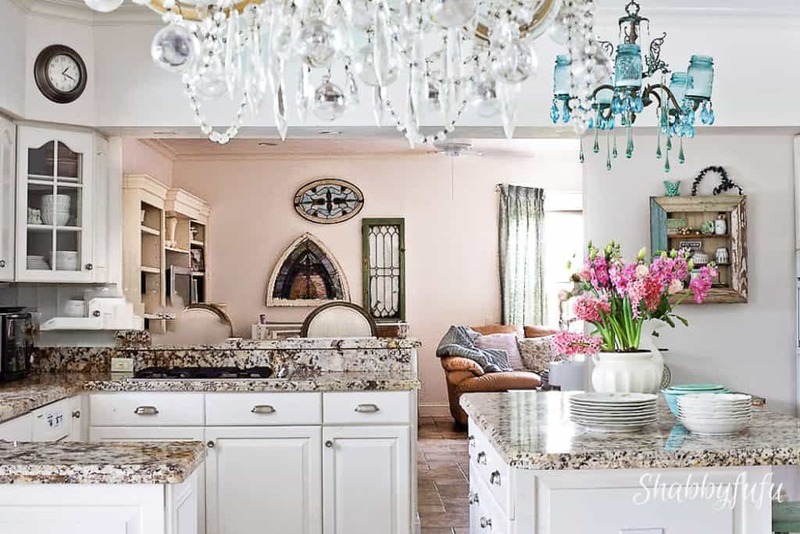 Lots of white…rich color in the granite and the stone look tile floors, and my collections of old things in aqua. Keeping the kitchen a timeless white was popular then and will never go out of date! It looks wonderful, Janet. It is amazing what you can do on a budget and with imagination and patience. It's all so timeless and beautiful, Janet! 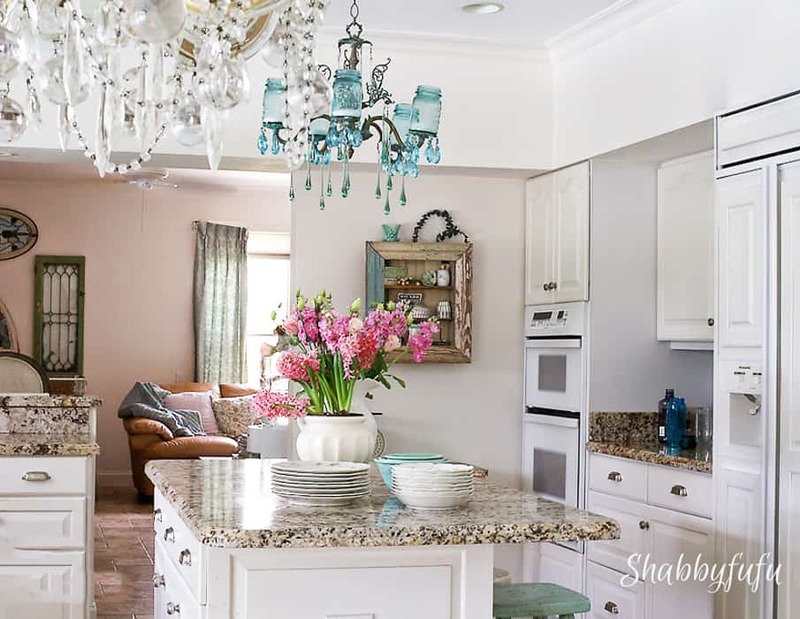 I have always loved white cabinets and someday I will have them. 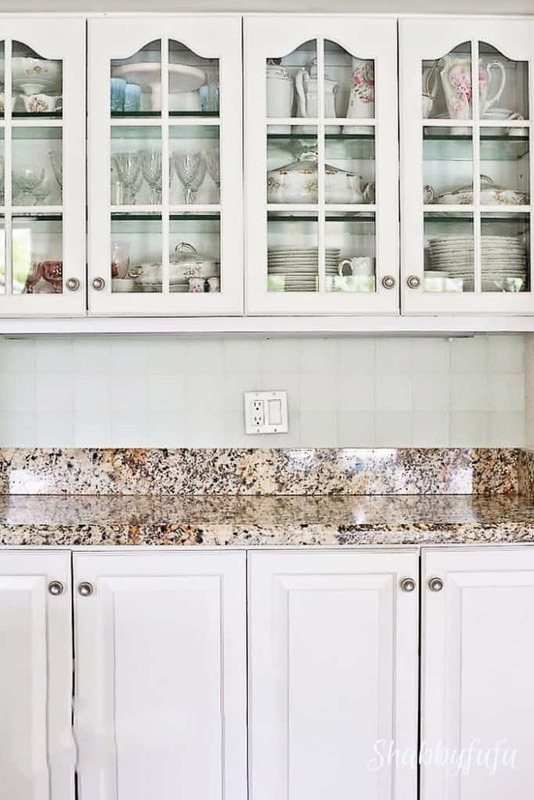 lol Your's truly look wonderful with the granite counter tops – which help "ground" all the white. The splashes of color throughout truly make it such a happy, cozy room! 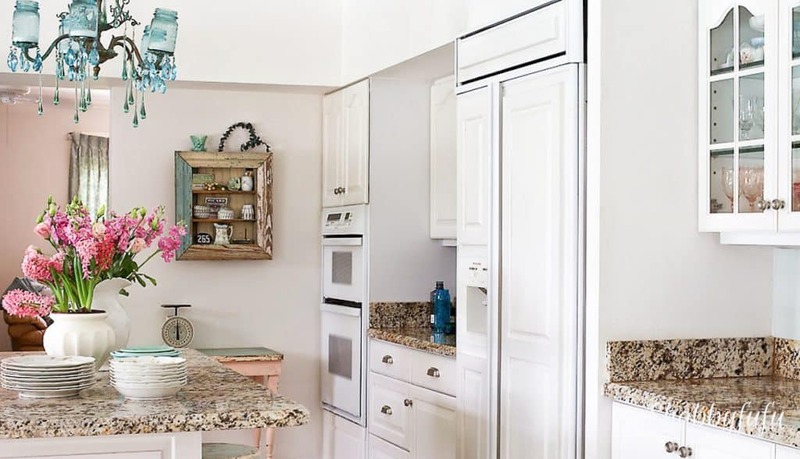 Thanks for sharing with us Janet your beautiful kitchen, most times we only see snippets of kitchens in blogland but its lovely to see the whole kitchen to see how all the styling comes together. Janet I love your kitchen. It certainly is timeless! The pillar is fabulous and I adore your touches of aqua. Happy Easter. Your kitchen is so welcoming and beautiful. 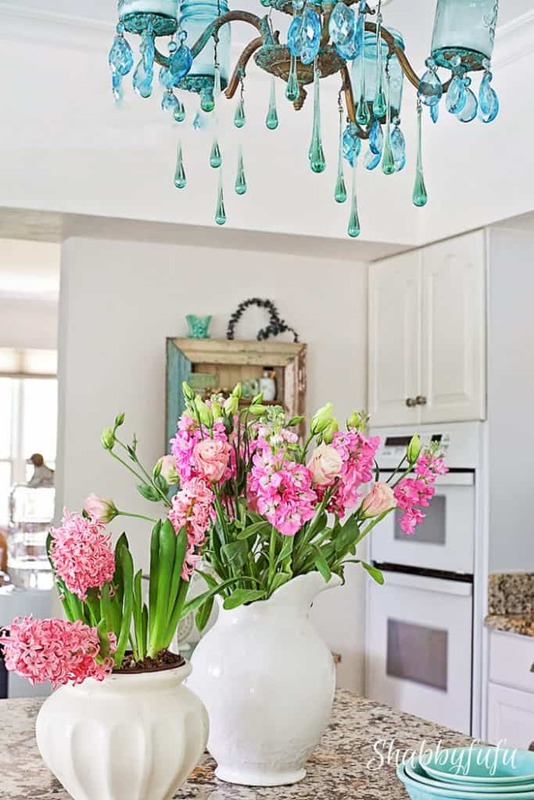 Love the colors' the mason jar chandelier is the crowning touch. Love your kitchen. I do like a white kitchen and the countertops are wonderful..Your chandys are the best! [email protected] Have a happy Easter.